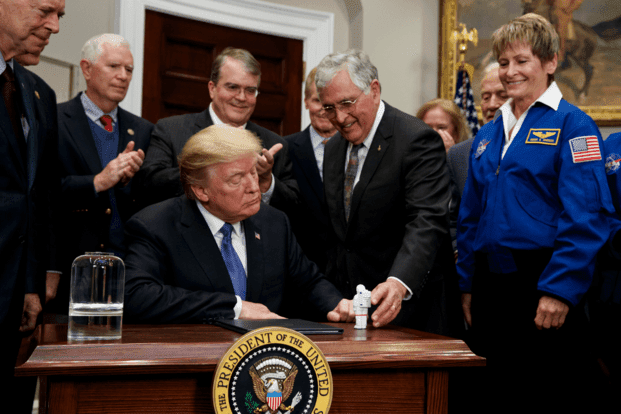 It was the middle of March when President Donald Trump mentioned the prospect of creating a new branch of the military, a "Space Force." It was immediately the subject of ridicule and conjured up visions of Star Wars Stormtroopers with laser guns fighting galactic battles in space. Once again, on May 1st, the idea was suggested at a ceremony held at the White House to honor the football team of the Army's military academy, West Point. This time, the details seemed to be a bit more serious. Forty-nine days later on June 18, 2018, the president signed an executive order directing the Pentagon to create a sixth branch of the military solely dedicated to protecting space-based assets, and presumably ready to proactively engage in offensive measures against potential enemy's satellites, and space-based weapons. "I am hereby directing the Department of Defense and Pentagon to immediately begin the process necessary to establish a space force as the sixth branch of the armed forces. Our destiny beyond the Earth is not only a matter of national identity but a matter of national security." Trump went on to describe space as "a war-fighting domain just like the land, air, and sea." For some, it may have seemed like a long time coming. For others, it was nothing more than the creation of another government bureaucracy. Unlike America’s space efforts with NASA and the Air Force performing distinct functions, the line between the civilian and military in China and Russia's space programs is non-existent. While around the globe, the list of space-capable nations is rising, not all on friendly terms with the United States. Several, like North Korea and Iran, are capable enough to launch and explode rockets that could create space debris clouds resulting in damage to critical allied space communications and GPS satellites needed in a conflict. There is the threat from Russia which recently made headlines for what is believed existing on orbit maneuverable satellites classified as "inspectors" that could observe, collide, or otherwise disable other satellites.1 That's not to say that the U.S. is behind in the utilization of space as a military platform, it’s just that the threat is evolving, and becoming more dangerous. reasons, it seemed to retreat from the forefront through the decades with both the U.S. and Russia continuing to hide from public view the development of a myriad of space weapons. It came to the forefront again when President Reagan proposed what came to be known as the Star Wars missile defense program. The threat seemed to recede once again until in 2007 when China launched a ground-based missile and successfully took out one of their old weather satellites.3 In a high stakes response a year later, the United States Navy fired an interceptor rocket from an Aegis cruiser and successfully hit one of its own non-functioning satellites. Here we are today, with more threats, continued advances in technology, and increasingly more players in the space arena. Currently, the U.S. Air Force "Space Command" is in charge of "space efforts" on behalf of the military. It receives the majority of Defense Department funding, about $12.5 billion for FY 2019.2 What is not counted in those dollars are any "off the books" projects and the operational and support costs baked into existing DOD manpower budgets. By the time it is all counted, the total military space budget likely exceeds what NASA itself is currently allocated. 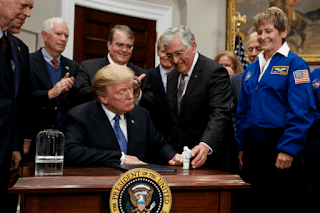 The U.S. civilian and military space programs had a long history of partnering before heading down separate roads and arriving today at what is proposed as a more focused and independent military space force. What follows is a brief history of the early days of NASA and the Air Force's partnership in space. As World War II ended, the race began to utilize the weapons of war Germany had developed. Germany had provided the world a glimpse of future battles and the new face of warfare. Ballistic and cruise missiles demonstrated the potential that the weapons of space, even at their rudimentary beginning, could have in war. While the age of modern rocketry was born of wartime needs, others dreamed it could take humans to the stars. Among the documents recovered after the war were the plans for winged rockets that would soar into space and reenter as high-speed bombers over an unsuspecting America, and vehicles that would take humans to orbiting space stations and then on to Mars. 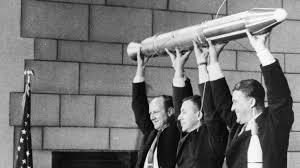 1957, the biggest upset of all, upstaged by the Soviets launch of Sputnik and the fear in America that a missile gap had developed and the U.S. has fallen technologically behind its ideological rival. Fresh from victory in World War II, the America military juggernaut stood alone on the global stage as the technology leader and manufacturing giant that could wage conventional war with staggering capabilities and one that could arm allied nations and devastate their enemies. Germany’s research and weapon advancements had changed the perception of how wars would be fought and how space technology and weapons could be used not just offensively, but also to deter war. In capturing the spoils of war, America gained the leading experts on German rocketry and an invaluable set of working hardware and plans. The leadership in America saw rocket weapons as attractive, but not a replacement for tanks, planes, bombers, and carriers. America would allow the Von Braun team to languish at Fort Bliss, Texas, while the Soviets gained momentum.6 The Soviets realized the American advantage and viewed rockets as the force equalizer that could negate America’s conventional forces. In the early days of what would become the modern space age, America would be confused on what direction to take. The Army saw rockets as battlefield weapons that could be used against short-range targets7, the Navy saw satellites and even manned space stations as a way to help monitor fleet activities, as the Air Force focused on intercontinental missiles and putting its own men in space. It would finally take the launch of the Soviet satellite Sputnik before American began to coordinate its space activities. throughout America. The general American sentiment was that if the Soviets could fly a satellite overhead, they could certainly do the same with a bomb. 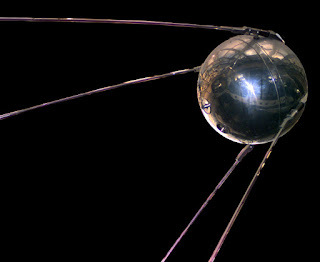 President Dwight Eisenhower dismissed Sputnik “as one small ball in the air”.6 The public was less forgiving of America as a country that followed rather than led when it came to breakthrough technologies. The U.S. would respond a few months later with a more capable satellite on an Army rocket that was little more than an advanced version of the V-2. That successful launch came after an embarrassing failed launch by the Navy with Vanguard 1. That botched attempt brought ridicule with names given to the event as "Flopnik" and "Kaputnik". 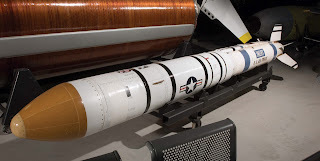 Eisenhower wanted to consolidate all U.S. rocket projects, defense, and civilian, under the wing of the Defense Department's ARPA, the Advanced Research Projects Agency. Vice President Richard Nixon and Eisenhower’s Science Advisor James Killian persuaded him to pursue another course, dividing the growing space need under three umbrellas: civilian, defense, and reconnaissance.8 With the public’s apprehension still at a high, Eisenhower agreed. Mainly to appease the public outcry, Eisenhower created NASA in October of 1958 to handle civilian activities in space. The 1958 legislation that created NASA would divide America's space mission between NASA to handle civilian space activities and the Air Force to handle military space needs. Eisenhower had strong reservations about the creation of the agency. While the value of space power would soon pay off for the military, creating a civilian agency that would target sending humans into space he thought was a waste of public resources. The Army, coming off the success of having designed the rocket that put America’s first satellite in orbit, would now transfer their rocket team to the newly formed NASA. The Jupiter rocket that lifted Explorer into orbit was overkill for the Army’s needs, but a direct reflection of the skilled resources that had been working on the project. Meanwhile, the Air Force and Navy continued to pursue their independent programs, but the Navy would eventually transfer its efforts to the Air Force entirely by 1963. As Eisenhower left office and Kennedy's New Frontier began, the Soviets would continue to upstage America with the launch of the first man in space, and the first man to orbit the Earth. Before NASA’s first flight, the newly formed agency eyed the moon; to succeed they would need a strong partnership with the Air Force. The Air Force would supply NASA with ground support during the countdown, liftoff, flight, and recovery and provide NASA with man-rated boosters converted from ICBMs; namely, the Atlas and Titan II.4 The Air Force also tested components for its own space needs on NASA missions. NASA’s approach to space was to compete publicly with the Soviets on headline grabbing human endeavors in space, while the Air Force eyed a strategic military advantage. The creation of NASA would do nothing to stop the Air Force’s ambitions of putting humans into space.10 The Germans showed interest in the idea of a "space bomber" that could target America, but time would run out in the war before the concept could be developed. 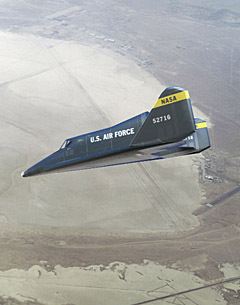 Now, the Air Force would pursue its own version called Dyna-Soar, short for "Dynamic Soaring." Dyna–Soar had been planned as a strategic weapons system capable of reconnaissance, repairing satellites, damaging enemy satellites, bombing, and capable of bringing offensive weapons to space.5 It was a small delta wing vehicle that would be manned and reusable. At first, Dyna-Soar was to be a suborbital glider, and then grew to be a fully orbital craft that would return to Earth and land on a conventional runway. The change in purpose was significant. Rather than perform as a “hit and run” bomber, Dyna-Soar could stay in orbit to conduct research, observation or other research as the Air Force needed. 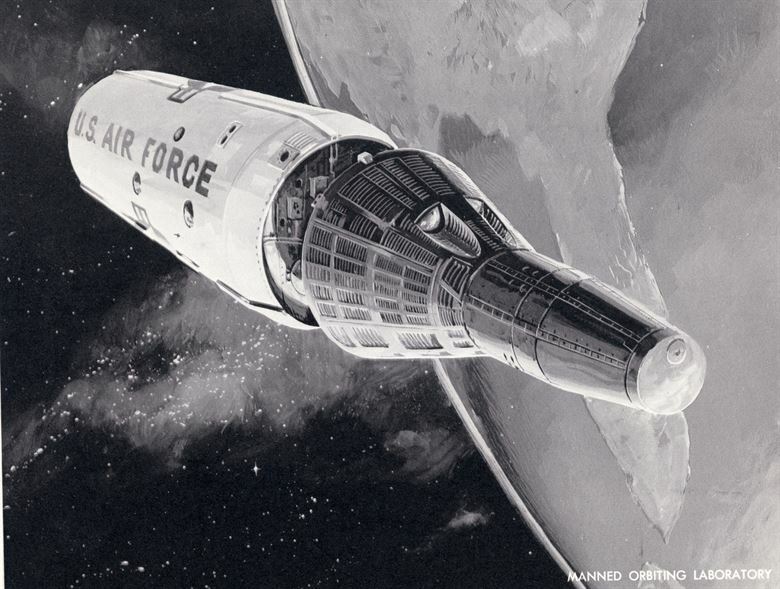 While Dyna-Soar was in discussion, the Air Force also contemplated its own manned space station called the Manned Orbiting Laboratory (MOL). Perched atop a Titan rocket, Dyna-Soar could be the vehicle to take Air Force personnel to and from their space station. space. Eugen Sanger, a German scientist who did not come to America after the war, would be the man conceptually responsible for the Air Force’s first attempt at manned flight. Sanger had developed early concepts for a reusable space plane. While the Air Force refined concepts for its manned space program, NASA had begun its march to the moon with the Mercury and Gemini programs. America appeared to be on track with two parallel programs that would develop the skills and assets to create a versatile civilian and military presence in space. Though the Air Force had changed the design and function of Dyna-Soar from a one-man bomber to a research vehicle, the stigma remained. The direct militarization of space was something Eisenhower and Kennedy alike had hoped to avoid. Soar came on the advice of Johnson’s Defense Secretary Robert McNamara, but Johnson agreed to consider the Air Force’s request for construction of the Manned Orbiting Laboratory.11 MOL would use existing Gemini spacecraft and a habitat that would be launched with the vehicle. Astronauts would crawl through a hatch in the heat shield to access the lab and would be able to stay on board for up to thirty days to conduct experiments. The U.S. Air Force pitched the MOL as a way for the military to explore the usefulness of having their own dedicated personnel and equipment in space. On August 25, 1965, Johnson, after twenty months of deliberation, gave the go-ahead for the Air Force to begin development of the MOL. Publicly, the Air Force praised Johnson's decision "as one of the most significant political decisions of the space age….ranking in importance with the May 25, 1961, announcement by President Kennedy of the Apollo moon landing program".11 The MOL seemed on track to become America’s first space station and was scheduled for its first flight in late 1968, but the effort did not go unnoticed in the Soviet Union. Much like the Soviet’s early success in space served as a motivator for the U.S. program to reach for the moon, Johnson’s announcement of a military space station became the justification for the Soviets to begin a military manned space station project, codenamed Almaz. Nineteen Sixty-Nine would be a year of great success for the American space program. In July, the space race had officially come to a close as Neil Armstrong and Buzz Aldrin set foot on the moon and returned safely to the Earth fulfilling Kennedy's challenge. 12 There would also be another change in Presidential leadership, as continued problems at home and with the Vietnam War raging abroad forced Lyndon Johnson to forego seeking another term as President. Richard Nixon, the man who just ten years earlier advocated for the creation of NASA, would now control the future direction of the agency. Nixon would quickly make a series of decisions related to the space program that would cripple it for decades to come. First, the Air Force's MOL program was canceled. The Air Force had underestimated the complexity of building and operating a manned space station. The project was over budget and behind schedule. It had missed its first launch date by a year and a new expects launch date was nowhere in sight. Officially, the reasons cited were that orbiting satellites had eliminated the need for manned observation platforms. Had the MOL project remained on schedule or had it not suffered the 20-month delay due to Johnson's indecision about the effort, it may have gotten off the ground and been spared Nixon's ax. Nixon was increasingly burdened with the escalation of the Vietnam War and problems with the economy. Within a year of taking office, he sought to cut NASA's budget dramatically. Initially, Nixon wanted to end all manned space flight in favor of unmanned missions but was convinced to build the Space Shuttle on the promise that it was the cheapest option for spaceflight.13 The Space Shuttle would undergo numerous design changes to accommodate Air Force and NASA requirements, but ultimately would not fully meet either’s needs. The shuttle’s first flight would end up being more than a decade away. NASA and the Air Force stand down for years waiting for its arrival. In anticipation of the shuttle’s arrival, the Air Force began selecting astronauts that would fly classified and dedicated missions. 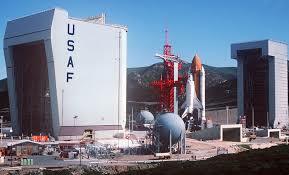 They also began construction of a shuttle launch facility at Vandenberg Air Force Base in California. When the shuttle finally flew in April 1981, it fulfilled the Air Force’s original dream of a winged reusable vehicle, but the complexities of the shuttle often meant delays. The promised flight schedule proved difficult to achieve, and while the Air Force did fly several classified missions, the compromises made a decade earlier in the design, and the Challenger accident forced the Air Force to return to unmanned launch vehicles. The shuttle was no longer reliable and had difficulty meeting the demands placed upon it. No Space Shuttle launch would ever use Vandenberg facility for a launch. For a brief time during the space race, the combination of NASA and the Air Force seemed a potent force that would create for America a well-rounded space capability from winged space planes to space stations to lunar landers. The space race and the growing unrest at home and abroad would force tough decisions that would end up affecting both space programs. NASA would go on to reach the moon and fulfill Kennedy’s goal, but nearly be disbanded and forced to stay in low-earth orbit for decades to come. The Air Force’s dreams of manned spaceflight evaporated. The Dyna-Soar program, though it had never taken flight, managed to continue to contribute to future projects. Thirty-three of the sixty-six projects related to reusable spaceplane technology continued and produced valuable spinoffs, or the products were used in Apollo and the Space Shuttle. Nixon's cancellation of MOL wasted the years of effort and expense that went into the project. While justified on the grounds that indeed satellites had replaced the need for human observation platforms, its cancellation reflected shortsightedness regarding the other potential uses of an orbiting outpost. Seven of the fourteen astronauts from the MOL program were transferred to NASA, but the remaining research and equipment were jettisoned. NASA had one shot left at a space station. After Nixon had canceled the remaining three lunar missions, he agreed to use remaining Apollo hardware for a manned space station that would be called Skylab.14 Skylab would fly but would be parked in orbit after three visits awaiting the arrival of the Space Shuttle in 1979 to boost it to a high orbit. The Shuttle came too late to save Skylab. America’s first and only solely owned and built space station would come crashing down over the Indian Ocean and Australia in July of 1979. The second Skylab would never fly and became a museum artifact. The Shuttle briefly gave the Air Force the manned space program longed for since the late 50’s; but after several missions, NASA and the Air Force would part ways and leave human spaceflight to the civilian program it had supported early in its history. Those early partnerships and dreams that each had of building America's manned space capabilities would wither. NASA would go on to struggle with operating the Space Shuttle and America would lose the sustainable and flexible space program that fifty years later it seeks to create once again. 4. Cadbury, Deborah.(2007). Space Race: The Epic Battle Between America and the Soviet Union for Dominion of Space. New York: Harper, 2007. 6. Brzezinski, Matthew. 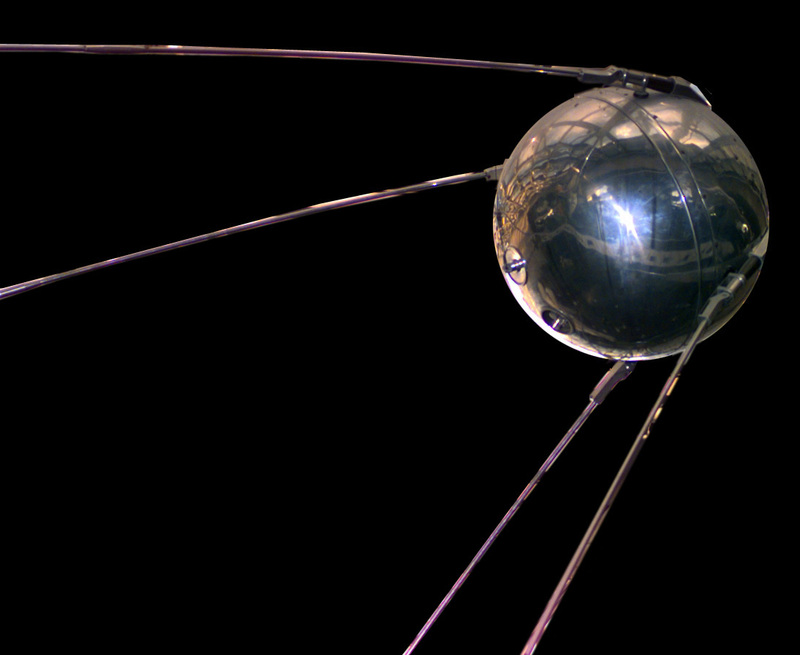 Red Moon Rising: Sputnik and the Hidden Rivalries that Ignited the Space Age. New York: Henry Holt and Company, 2007. 9. Air Force (1965). The Air Force in Space. USAF Historical Division. Washington, D.C.
10. Godwin, R., (2003). Dyna-Soar: Hypersonic Strategic Weapons System. Detroit: Apogee Books. 12. Baker, P., (2007). The Story of Manned Space Stations. Berlin: Springer. 13. Lambakis, S., (2001). On the Edge of Earth. Lexington: University Press of Kentucky. 14. Shayler, D., (2001). Skylab. Berlin: Springer. Ferrying the Shuttle - Part One: How Do You Ship A Space Shuttle? In April of 1972, John Young and Charlie Duke landed Apollo 16, the next to last Apollo lunar mission, in the Descartes highlands. 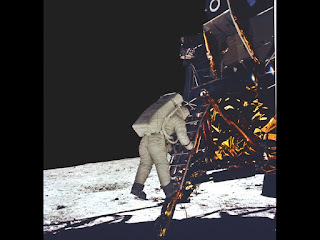 It was during one of the moonwalks that the word came from Mission Control in Houston - Congress had approved the NASA budget for fiscal year 1973 by a margin of 277-60. That vote included funding for the Space Shuttle. Upon hearing the news John Young remarked “the country needs that shuttle mighty bad”. Getting the funding for the shuttle was the first step. Getting the detailed design finalized and the shuttle on to development was the next critical phase at a pivotal time for the U.S. space program. One more lunar mission was still funded. The Skylab and Apollo-Soyuz Test Project were still NASA objectives for the seventies, but the long term future was for the decade to close out with the shuttle taking flight. As the Space Shuttle concept was close to being finalized, NASA has a pretty good idea of how the shuttle would get into space. Gone were ideas of a fully reusable flyback booster, It would ride two solid rocket boosters strapped to a giant external tank that fueled three onboard shuttle engines. The journey from ground to space would be full of obstacles for the shuttle program and delays were commonplace. The shuttle program would have to deal with issues around the tiles used for thermal protection and problems with the powerful Space Shuttle Main Engines (SSMEs). All of it would add to the budget overruns and delays resulting in the shuttle waiting until the beginning of the next decade to fly. What was less clear at the time was how the shuttle would move between earthly destinations. If the Space Shuttle did not have a way to conduct atmospheric tests or go from the factory where it was built or a return landing at Edwards Air Force Base to its home and launch site at the Kennedy Space Center, the shuttle might never reach space. Several concepts had emerged on how the shuttle would “shuttle” between California and Florida, and perhaps other destinations or alternate landing sites. In June of 1973, NASA seemed to have the answer. Unlike previous spacecraft, the shuttle was a hybrid, part space vehicle, part aircraft. What was never in question in the shuttle design is that it would launch like a rocket and land like an airplane. Since it had flight control surfaces and was intended to function like an aircraft on its return from space it made sense to leverage those capabilities and fly the shuttle like an airplane when the destination was not space. It seemed the perfect plan, fly the shuttle as an airplane when it needed to move around within Earth’s atmosphere. This was not exactly a new or revolutionary idea for the shuttle. Early in the design phase serious consideration was given to equip the shuttle with onboard jet engines that would be used on the return from space to give the shuttle flight capabilities consistent with an airplane. One concept was to stow the engines near the back of the fuselage behind the cargo bay and deploy these engines when the shuttle reached a safe operational altitude upon return from space. These engines would allow for a higher level of maneuverability and not rely on the shuttle functioning solely as a glider. It was an idea born out of safety. Surely the shuttle could not fly from space to ground only as a glider. The pilots had to have capability for powered flight if they needed to go around on an aborted landing or choose and alternate landing site. As NASA, the Air Force and the Nixon Administration haggled on costs and payload specifications, jet engines as a component of the final shuttle had to go. Internally stowed engines that would deploy within Earth’s atmosphere would add too much weight. The engines, the fuel, the additional controls, wiring, and backup redundancy would add thousands of pounds of weight to the shuttle and drastically reduce the amount of payload it could haul to orbit. While jet engines as an operational component of the shuttle were off the table there was still the issue of how to transport the shuttle between destinations on earth. For that problem, the use of jet engines in some capacity on the shuttle was still in play. On June 26, 1973, that problem appeared to be solved. NASA announced that had selected the Pratt & Whitney TP33-P-7 engine to install on the shuttle for both atmospheric testing and for use when the shuttle needed to move between ground destinations. The TP33-P-7 engine was already tested and proven on the Air Force’s C-141 Starlifter and had 21,000 pounds of take-off thrust. NASA agreed to purchase 25 of the engines. At the time it joined the shuttle’s development and production, the main engines, and the integration of the shuttle systems to become the fourth major contract awarded in the shuttle program. At least on paper, things were on the move in the Space Shuttle program. It did not take long to figure out that the concept of ferrying the shuttle like an airplane between ground destinations was not going to fly. The numbers just were not adding up, but the risk factors were rising. The idea was to install six airbreathing jet engines beneath the shuttle. The engines would be fed by a fuel tank that would be placed in the aft section of the payload bay. The shuttle would be configured in this mode for atmospheric tests and when the shuttle needed to ferry itself from California to Florida. The Space Shuttle would then fulfill the dreams of many a science fiction fan by having a spacecraft takeoff and land from a conventional runway. However, in this mode the destination would never be space. The shuttle was by 1970’s technology standards the most complex flying machine humans had ever built. Its engines, operating parameters, and thermal protection system would be at the far end of machine performance. The shuttle would have two and a half million moving parts with one thousand of those rated as a single point of failure. Just one failure out of a thousand parts could cause a loss of crew and vehicle. When the last shuttle flew, it still held the title of most complex flying machine, and arguably the most complex machine ever built. Now, with the idea of using the shuttle to transport itself another level of complexity was added. The Orbiter has often been referred to as a ‘flying brick”. Under this plan, the “brick” would get jet engines and that was not going to be as easy as first thought. Soon, holes in the plan began to appear. The design of the orbiter would now have to account for the systems and structure to attach and detach jet engines and fuel. This meant the Orbiter would need to carry dead weight to space. Weight to support the engine pylons, added strengthening for stress and load bearing on the vehicle and the systems required to operate the vehicle in “airplane mode”. This meant controls and systems for thrusters, engine performance, and a host of other electronics and subsystems. It would also mean that the Space Shuttle Main Engines (SSMEs) would need to be removed before the ferry flight to save weight and balance the vehicle. If engineers could work out those details there was the issue of hot exhaust and particulate coming from the engines and potentially damaging the orbiter’s sensitive tiles and systems. Placement of the engines would also be an issue as there were potential problems with the Orbiter’s center of gravity. Finally, if everything came together as envisioned, the devil would be not only on the details, but in the execution. For the plan to work skilled technicians would have to install and uninstall this added equipment after each ferry flight. That would mean time, expense, and more hands in and around the Orbiter before and after ferry flights. It also would mean more inspections and checkouts of more systems. Parts, equipment, and personnel would need to be transported across the country. Not known at the time the idea was first put forth would be how fragile the Obiter would actually be to operate and maintain. Considering the extremes the vehicle was designed to withstand, in many ways it was as fragile as glass. The slip of a tool by a technician could easily crack the fragile tile system. The logistics and risk of making NASA's Orbiter a ferry were mounting. To add to it were the performance numbers and range of a “jet-equipped” Space Shuttle. The shuttle could only carry enough fuel to feed those thirsty six engines for slightly more than 400 miles under typical conditions. It would require a 10,000ft runway for takeoff and had a maximum operating ceiling of 10,200ft. It could only sustain a failure in one of the six engines and even then would have to land at the nearest available field. An emergency landing at a field that did not meet specifications could spell trouble. There were few ways to lighten the Orbiter to use a shorter runway. Jet engines on an Orbiter could have been tested on the Enterprise. Enterprise was not a "space ready" vehicle, but rather a test article that had planned to be converted to a full operational shuttle at a later point in the program. Improvements in the construction of the subsequent shuttles lightened the vehicle and made converting the Enterprise costly and impractical. There would have been little value in the plan other than to test the vehicles aerodynamics and handling capabilities. It would not have been a good test of actual conditions when the shuttle finally flew. The Soviet version of the Space Shuttle did take this approach and their test article shuttle, the OK-GLI, was equipped with tail mounted jet engines. The OK-GLI flew 25 times in this configuration and like the Enterprise was not a "space-ready" vehicle. The Soviet's motivation for testing their version of the Orbiter was also due to the lack of a ferry airplane. By the time the Soviet shuttle was under development their "piggyback" aircraft, the AN-225 was still being built. The Soviet's could not wait and opted for a "jet powered" shuttle, but only for atmospheric testing. It was all adding up to a complicated and risky approach. The Orbiter flying itself had so many drawbacks that there had to be a better way. The idea of having the country’s newest space vehicle built at a cost of one and a half billion dollars each flying with such slim margins for error were unacceptable. The search was on for Plan B. If the shuttle could not fly itself across the country then how do you get a spacecraft that weighs as much as a Boeing 757 from California to Florida? One idea proposed by Lockheed was to "tow" the Orbiter behind a C-5. This method would be used to ferry the vehicle and for drop tests. The plan called for a 1000ft cable linking the two, but doubts about the tension in the cable and the effect of jet wash on stability quickly nixed the idea. Despite the fact that Lockheed had faith in the concept, much like the other options on the table it seemed too risky an approach. In the event that the cable had to be detached in an emergency, or that it snapped in flight, the Orbiter would become a piloted glider with few options to maneuver to a suitable landing site. The outcome likely would have been the loss of the vehicle and possibly the loss of crew. NASA was searching for the middle ground trying balance the safety and protection of their newest spacecraft against the expense. The inspiration that would lead to the final design would come from the X-15 program. It was suggested that perhaps the vehicle could be stowed under the wing of an aircraft and transported from site to site or used for drop tests similar to previous NASA test vehicles. The Orbiter is not an X-15, it is large and it is heavy. No aircraft existed that could carry the shuttle tucked under its wing like the X-15 was under a B-52. There was no shortage of other ideas. There was the concept of designing the Orbiter with removable wings or wings that could be “changed out” for ferry flights. That seemed to be too expensive and would likely add weight to support the attach and detach support structures. Given the size and weight of the Orbiter it would have to be centered underneath an aircraft. The only way that could be reasonably accomplished would be to build a plane with a twin fuselage joined by a straight center connecting wing and hang the Orbiter right in the middle. As the brainstorming continued, four options for this model were kicked around by engineers. The first would involve building a brand new one of a kind aircraft from scratch, but using “off the shelf” components. In this model, the ferrying aircraft would not need a twin fuselage, but would be low mounted in the center of the aircraft and the cockpit would be above the Orbiter. Picture the second story cockpit of the 747. Another concept dubbed the "long leg" approach called for center mounting the Orbiter underneath a C-5. To make room for the shuttle the C-5 would be equipped with extremely long landing gear to provide adequate clearance under the aircraft. Other ideas for ferrying a low, center-mounted shuttle involved using two 747s or two Air Force C-5 Galaxies. Under this plan, the 747s or C-5s would have a left and right fuselage and outer wing joined by a massive straight center wing. By any standards, this would have been the world’s largest aircraft, but it was not to be. Another possible selling point to the low mounted Orbiter in this "twin" configuration was that it might have been possible to use the same aircraft to transport the shuttle's external fuel tank on a separate flight. Some proposals called for such a capability. The odds of getting one C-5 from the Air Force was unlikely, the chance of getting two, then cutting them in half was going to be out of the question. The going rate for a single C-5 was not too far off from the cost of the Orbiter. For NASA, the 1970’s was all about change, small change. The budget was not going to allow for large expenditures, if the Shuttle needed help getting around it would need to do it in the least expensive way possible. The only remaining option now was the “piggyback”. Putting the Orbiter on top of a plane and letting it catch a ride seemed the simplest method. The 747 and the C-5 seemed the logical choice, but could they safely carry a Space Shuttle?